Pain is one of the most common reasons people seek health treatment. Pain is one of the most common reasons people seek health treatment. The International Association for the Study of Pain (IASP) defines pain as ‘an unpleasant sensory and emotional experience associated with actual or potential tissue damage, or described in terms of such damage’. One in five people of all ages have moderate to severe chronic pain, with one third of those in pain and of working age unable to work, says the IASP. According to the National Pain Audit (NPA), an estimated 7.8 million adults and children in the UK are living with severe pain. In September, the RCN published a new knowledge and skills framework on pain, aimed at the entire nursing team, from healthcare assistants to nurse consultants. Before its publication, there were no nationally agreed standards, competencies or frameworks for pain management nursing in the UK. 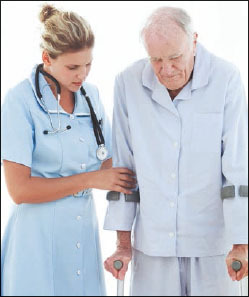 While assessing and managing pain are key components of nursing care, nurses often do both poorly, says the RCN. The framework looks at understanding pain and assessing it; strategies to manage pain, including physical, self-management and pharmacological; service development; and complex pain management. Pain is usually categorised as acute or chronic, with chronic pain being defined as lasting three months or more. Poorly managed acute pain may result in the development of chronic pain, says the RCN. Severe chronic pain adversely affects employment status, daily activities, relationships, mood, sleep and all aspects of general health. Chronic pain can be a condition in its own right or a component of other long-term conditions. Older age, being female, poor housing and employment type, such as heavy manual work, are significant predictors of chronic pain, says the NPA. With an ageing population, increasing obesity levels and declining levels of physical activity, the need for pain management is expected to rise. Suggest different techniques that may help your patient better manage their pain. The British Pain Society recommends deep breathing, relaxation, thought distraction, hot and cold compresses, reducing stress, remaining positive and exercise. An NHS self-help course that includes pain management is the six-week Expert Patients Programme, designed to manage long-term health conditions. ‘The aim is for the framework to be as useful to a healthcare assistant who might only spend one hour with an older person who has pain on waking as it is to a highly specialised nurse consultant. ‘Assessing pain is fundamental to its effective management and that is everyone’s responsibility. Pain is individual and a patient’s self-report is most useful. For patients who are unable to do this – through dementia or profound learning disabilities – there are validated tools.